This motorcycle tour of South Africa has it all. Experience African wildlife and South Africa’s best roads on an exciting 10-day adventure. This tour takes place in Mpumalanga, often referred to as "bikers paradise", the Kruger National Park, Kingdom of Swaziland, Lake Jozini, Tembe Elephant Park and the Kwazulu Natal Battlefields. This part of South Africa is off-the-beaten-track - it is the real Africa! You will stay in three to four-star lodges and hotels, on a bed and breakfast basis. Sama Tours has personally chosen all the accommodation based on their high-quality standard, beautiful surroundings, and charming settings. Your accommodations will mostly have outstanding views and will be surrounded by a lot of good places to relax and have fun in. Welcome to South Africa. You can arrive at any time on “day 0” as your motorcycle tour only officially starts on “day 01”. Tonight’s accommodation is included as “your bonus night”. A friendly Sama Tours representative will meet you at the airport and transfer you to your hotel in Pretoria. This morning, Sama Tours will hand over your motorcycle to you and you will sign all the paperwork. After that is complete, you will have a tour briefing and then the fun will begin. You'll start off by taking a tour of a small township just North of Pretoria to experience all the vibrant colors, sounds and tastes of Africa. You will have lunch in a tavern in the township, followed by a visit to a rural motorcycle mechanic shop. Afterwards, you enjoy a guided motorcycle ride through a BIG 5 nature reserve. Rhinos, giraffes, impala’s and wildebeest can all be spotted from your motorcycle. Tonight, you have a welcome dinner in an African Boma. Welcome to Africa! Today, you make your way up into Mpumalanga, an area known to local riders as “biker paradise”. As you head up north, the roads become mountainous with beautiful views of the rolling hills below. A highlight is riding Long Tom Pass. Enjoy the great twisties and arrive in Hazyview in the last afternoon. You will make your way down to Mpumalanga, an area known to local bikers as “Motorcycle Paradise”. The roads there are beautiful and curvy, and there are so many great viewpoints, rock formations, and waterfalls along the way. The route includes stops at Bourke's Luck Potholes, The Three Rondavels, and Gods Window. You will arrive in Hazyview in the late afternoon. In the evening, you will be booked for the Shangana Cultural evening which includes traditional African dances followed by an African feast. Today, you will bid goodbye to the motorcycles and board a game viewing Safari vehicle which will transport you into the Kruger National Park. This world-famous wildlife reserve is home to the BIG 5 and is roughly the size of a small country. The vastness of the park allows ample opportunity to view wild animals in their natural habitat. You will have a full morning to spot lions, elephants, birds and many different species of animals. In the afternoon, you will return to your hotel in Hazyview, where you can relax around the pool or take part in any of the optional activities in the area. After breakfast, you will depart for the Kingdom of Swaziland, the home of the friendly Swazi people. After border procedures (passport and possibly visa required), you will weave your way along the winding country roads and mountain passes. You will visit Swaziland’s own glass factory, Ngwenya Glass, and see the world famous Swazi candles being handcrafted at Swazi Candles. There are many excellent restaurants, pubs, and craft markets in the Ezulweni Valley where you will overnight at. It's an excellent country lodge with its own magnificent restaurant with spectacular views. Today, you make your way through Swaziland to South Africa’s Zulu Kingdom, the homeland of the proud Zulu nation. In the late afternoon, you arrive in Lake Jozini. Your lodge is in the hills overlooking the spectacular Jozini Dam and surrounded by wildlife parks. Enjoy a drink on the deck while watching another spectacular African sunset. Today, you will be up bright and early for a Safari into Tembe Elephant Park. Here the Big tuskers roam - with African Largest Ivory Tusks. This is also home to the Big 5 and your local guide will make the bush come alive. You will return to the lodge in the early afternoon and are free to relax at the pool, book an African spa treatment or even try your hand at Tiger Fishing. Time to head inland to the battlefields of South Africa, an area of huge historical significance during the famous Boer-Zulu - British Wars. You arrive at your lodge early in the afternoon, and embark on a tour of the battlefields with a knowledgeable guide who will make them come alive! Time to head back to Pretoria, after a scrumptious breakfast, you start the journey back! It is a nice relaxing ride through the interior of South Africa, The bikes will be returned in the afternoon and in the evening, you will have a get together where everybody can reminisce about the previous days after which you will be returned to the hotel. Sadly, your tour of South Africa has come to an end. Sama Tours guarantees that you will take home loads of awesome photographs, fond memories of South Africa, and the warm people you have met. Your transfers to the airport will be arranged. This ride is suitable for most motorcyclists. 99% of the ride is on good tarmac roads. There are also some exciting off-road options on good hard packed gravel roads. Daily distances are relatively short (more than 450 kilometers), there are rest days scheduled regularly and there are no long border crossings. This tantalizing tour of South Africa combines motorcycling with culture, adventure, and South Africa's most beautiful destinations. 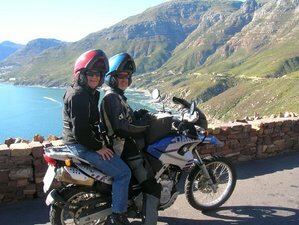 You will start in Pretoria where you will enjoy a motorcycle safari through a Big 5 game reserve. From here, you will make your way through the twisting mountain passes of Mpumalanga, visiting the Shangana Cultural Village and the world-famous Kruger National Park, followed by the Kingdom of Swaziland. Throughout the tour, you will have 10 breakfasts, 8 lunches, and 9 dinners. The most amazing motorcycle adventure you have ever had! Activities and meals not listed in "What's included"
Please arrive at Johannesburg International Aiport (JNB). Afterward, Sama Tours' staff will pick you up to drive you to your hotel. This transfer is included in the price. Single room supplement is available for 6,560 ZAR per person. There is a possibility to share a twin room with another rider; in this case, the single supplement will not be applicable. Please mention your choice while inquiring. Pillions (passengers) can join for 23,300 ZAR per person.